The Paris Metro was originally known as the "Chemin de Fer Metropolitain" ("Metropolitan railway"), then "Metropolitain," quickly abbreviated to "Metro". Inaugurated in 1900, it is one of the oldest subway systems in the world, and the second biggest in number of stations, right next to New York City. The system consists of 16 lines, identified by numbers from 1 to 14, with two minor lines 3bis and 7bis, numbered thus because they are branch lines split off from their respective original lines. The Paris Metro network has 221.6 km (137.7 miles) of track and 380 stations (87 offering connection between lines). Most of the network was built from 1900 to 1939. After the war, most extension focused on the RER, a metropolitan express subway system. 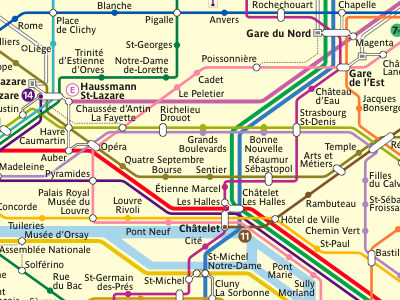 The images shown here are representative of the latest re-design of the Metro map, produced by the design agency bdcconseil (http://www.bdcconseil.com) in 2003. 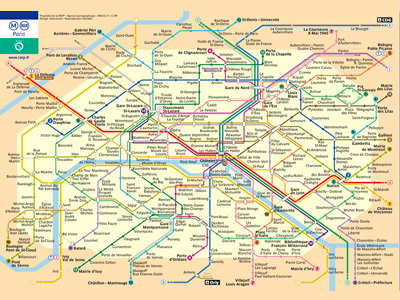 Click here to see the Paris metro network pictured at a geographically accurate scale.